This document gives a quick rundown on the Ford's Smartlock and Body Electronics Module (Hereafter called BEM), the features each model has, how to add and Remove Remote Keyfobs from the Smartlock Memory, and finally Information on Starting a Smartlock disabled vehicle. Please Note : The information provided regarding starting a Smartlock disable vehicle is not intended for criminal purposes. As such, the only method that I will describe herein requires access to the vehicle for a period of AT LEAST 30 Minutes. The Smartlock Security system fitted to the EBII Falcons through to the AUI Falcons, consists of two distinct parts. These parts include the Remote central Locking part, which consists of the Smartlock Remote Keyfobs, and the smartlock module itself. The other part of the Smartlock security system is the Ignition Cut-out, and Starter disable function, which is totally integrated with the EEC-IV(EB2-ED) and the EEC-V(EF-AU1) Engine Management systems. It is because of this total integration with the Engine Management, that the Smartlock system makes certain types of theft (Joyriding, Driving the Vehicle), very difficult for non-professional thieves. The Smartlock system CANNOT be Hotwired, (I.E. Bypassed by shorting, or disconnecting wiring), nor can it be simply removed. As mentioned above, these parts are electronically totally separate to one another. This means that the ignition cut-out will work automatically, regardless of the Keyfob operation. Also, remote central locking will also work, even if Smartlock has disabled the vehicle. Both these Smartlock sections have their own separate power supplies, and consequently, their own separate fuses. On the EB2-ED, this module is the Smartlock Module. On the EF-EL, this module was physically housed in what is called the BEM, or the Body Electronics Module. The Body Electronics Module is responsible for most of the mundane electrical features on the Ford Falcon series of Vehicles, from things as interior light delay, through to Variable Instrument Illumination, Power Antenna height, Variable wiper speed, and rear window demister timer. With the EF-EL Model Falcons, there were three distinct models of BEM fitted to various vehicles, and as such, each model had more features than the lower specified models. Please Note : The EF and EL Smartlock/BEMs are NOT Interchangeable Due to the Different Wiring Connectors Used. 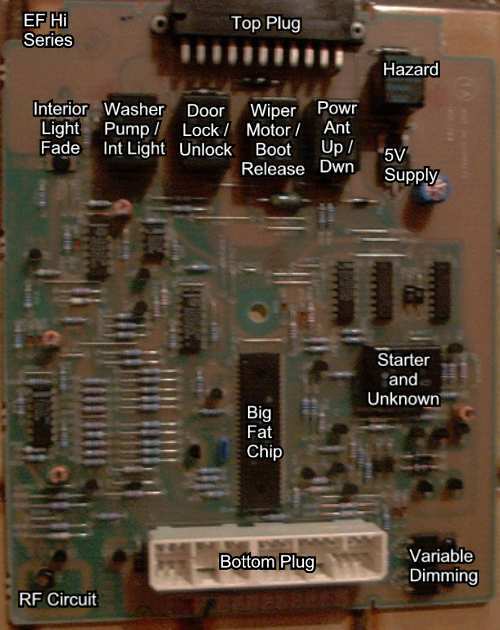 As mentioned above, there are three distinct types of BEMs made available on the EF series Falcon. A further 3 different BEM Models were introduced with the EL/NL/DL Model Falcons. Unfortunately, the EF and EL BEMs are NOT interchangeable, due to the different wiring connectors used between the models. Windscreen wash The EL Mid Series BEM also had the additional features of the Battery saver output, and the Speed sensitive Intermittent wiper control. independent Variable brightness for LCD Illumination and Graphics/Button Illumination, for Both Day and Night. When the Radio is switched on, it sends a positive voltage to the BEM via the Radio On line. The BEM then raises the Antenna to whatever position the Antenna position switch has been set to. When the Radio is turned off, the Radio brings the Voltage on the "Radio On" line to the BEM, to ground. Causing the BEM to fully retract the Power Antenna. With the ignition in the Off position, the Ford Factory Sound systems can be turned On for a further period of 1 Hour. The BEM will still control the Antenna Position, even with the Ignition in the Off Position. When the Central door lock switch is activated on the Remote Keyfob, the door locks, (including the tailgate on Wagons) will change state (Lock/Unlock). Unlocking the car doors with the remote keyfob, will turn on the Interior Dome lamp. The Dome lamp will stay on for a period of 20 seconds, or Until the Ignition Switch is switched to ACC, or ON. Opening an already locked door will turn on the dome lamp; when the door is closed, the dome lamp will stay on for 20 seconds. If a door is left open for a period longer than 60 Minutes, the BEM Will switch off the Dome lamp to protect the Battery. Unlocking the car doors with the remote keyfob, will turn on the Interior Dome lamp. The Dome lamp will stay on for a period of 20 seconds, followed by a Fade out period of 6 seconds. Opening an already locked door will turn on the dome lamp; when the door is closed, the dome lamp will stay on for 20 seconds, followed by a fade out of 6 seconds. If the Remote Keypad is used to lock the doors, before the 26 seconds is over (I.E. dome lamp is still on), the BEM will turn the dome lamp off. After a door is opened, the relay will stay energised for a period of 45 seconds. When the switch is moved to the Intermittent position, the wipers will operate one wipe, for every seven seconds. The intermittent wipe relay is held on for a period of 0.8 seconds. This feature operates in both the Accessories, and On positions. The wipers will wipe at a rate set by the rotating control on the wiper stalk switch. The rate is from 1 to 15 seconds. Dunno about you, but this feature was the main reason why I got myself a Fairmont Ghia ! The electronic immobilisation system is designed to protect the theft of the vehicle. The BEM controls the smartlock functions, and the electronic lock assembly that contains an electronic device with stored security codes. When the ignition switch is turned on, the BEM asks for 3 security codes from the electronic lock assembly. If at least 2 of these 3 codes are correct, then BEM will enable the starter motor to operate. The BEM also communicates with the EEC-V engine management system, which only allows the injectors to operate if the BEM receives the correct security codes from the electronic lock assembly. This prevents the motor from being started, if the starter motor is "Hot wired". The SMARTLOCK module can be programmed to recognise up to 4 keypads. The BEM can perform a self check, to verify the correct functioning of the SMARTLOCK system. The next time the ignition is turned On, the results from the previous self test are displayed on the flashing SMARTLOCK warning Jewel (LED) in the instrument cluster. The circuit board contains two infra red transmitters and receivers, and an E2PROM that holds the security codes. When the key is turned, the vane on the ignition switch rotates and reflects one or both of the IR Transmitters. This enables the electronic lock assembly to verify that the ignition switch is correctly fitted, and the position in which the key is in. When the key is turned to the On position, the electronic lock assembly transmits three codes from special memory locations to the BEM. 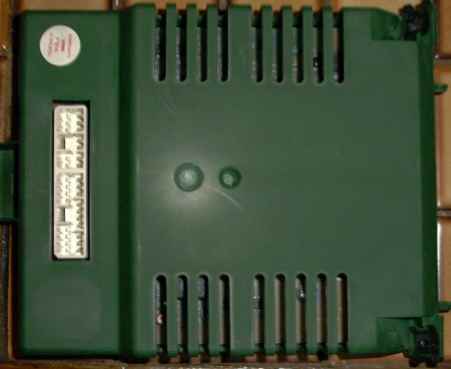 The keypad is a small radio transmitter that transmits to the BEM a unique code (for security) and a code to either lock/unlock the doors (and Tailgate for wagon), and to operate the Boot release. Up to four Keypads can be programmed and used with the Smartlock Remote Central locking system. 5. Follow step 4. for each keypad that is to be added to the BEM memory. A maximum of 4 keypads can be added to the BEM memory.NOTE : You must teach all remote keypads for the Smartlock module, before proceeding. 7. Check the function of both buttons on each keypad, to ensure that the keypad has been trained. The immobilised state is indicated by the Smartlock warning jewel (LED) as a rapid flash rate. The system enters the immobilised state if Smartlock receives at least two incorrect codes when the ignition switch is turned to On. When the car is in the immobilised state, you cannot start the engine, as the BEM has disabled both the starter motor, and the EEC-V system. If the cause of the immobilisation is a corruption of the codes during transfer, you should be able to start the car on the second attempt. Note : The remote keypads will still operate on an immobilised car, however an immobilised car will not display the immoilised flash with the ignition off, and will display the armed code as normal. If the cause is an unauthorised attempt to start the car, i.e. by hot wiring, the car will remain unstartable. However to prevent a vehicle from being completely immobilised, (Eg. due to a damaged electronic lock assembly data), you can start the car by using the method below. The following method must be used if the BEM, or the electronic module has been replaced, so as the new Codes from the electronic Ignition Switch are RE-LEARNT. 1. Turn all accessories off. 2. Turn the ignition to the On position. The Smartlock warning Jewel (LED) will flash any error codes, then finally the immobilised code. 3. Leave the car for 30 Minutes. 4. After 30 Minutes, the BEM will attempt to relearn the electronic lock assembly data. 5. If the learning procedure is successful, the warning jewel (LED) will then stop flashing and the door locks will change state twice. You can now start the car, and operate it as normal. 6. If the learning procedure is unsuccessful, the warning jewel (LED) will stop flashing and stay on, and you can start the engine. It may be a simple matter of adding an Intermittent Wiper Stalk, and running a wire to pin 10 on the lower Connector, to gain this feature. In any case, it is possible to upgrade the Low Series BEM, to a Mid series model, rather painlessly, in order to gain the above functions. If you are considering upgrading your BEM to a high series Model (As fitted to Fairmont, Fairmont Ghia, Fairlane, LTD, and ELGT), there is a fair amount of work involved, as the Lower Connector is completely different to those found on the Low/Mid Series BEM Models. 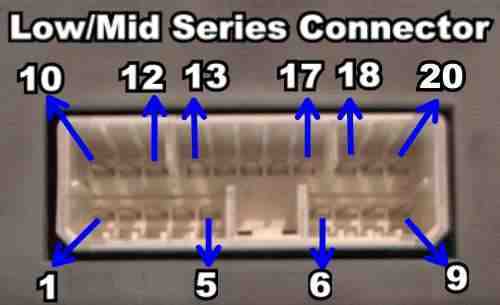 In considering this, there are ONLY 2 EXTRA FEATURES that the High Series BEM will offer, over the Mid Series Model. The Variable Day/Night Instrument Cluster and LCD Illumination - Requires New Dimmer Switch, and Wiring. If you have an EF GLi, then you will have the Low Series Black, or Grey BEM. It is quite possible to upgrade this BEM to the Mid Series EF Futura/XR Model Blue/Red BEM, to gain extra features not available to the GLi Models. Although the wiring connectors for a Low Series, and a Mid Series BEM are EXACTLY THE SAME, there are a number of changes you will need to make the Vehicles wiring, in order to obtain some of the added features this BEM upgrade can provide. The Next Mod you will want to make is adding a Variable Intermittent Wiper Stalk, and adding a wire from this, to the BEM. At present, I have not tried this modification, therefore I am not 100% sure of the best procedure to go about adding the required wire. Therefore, I am not sure if the wire already exists (Most Probably doesnâ€™t), and if there are any shortcuts that can be taken in adding it. If you are interested in carrying out this mod, then please let me know, and I will investigate this step further. The Next Mod you will need to make is cutting the wire going to the Front Washer Motor, and adding a new Wire going to from the BEM, to the Washer Motor. This Mod will then remove the control of the washer pump, away from the Wiper/Washer stalk, and allow to the BEM Module to have complete control of this feature. Basically, when this mod is completed, you will then be able to simply flick the Wiper/Washer stalk, and the Washer pump will operate for a period of 4 seconds. A somewhat useless feature, but an added feature nonetheless. The final Mod required is ONLY useful if you have fitted power windows. This feature is the Timed delay for the power supply going to the power window switches. Basically this will allow you to operate the power windows for a period of 1 hour after the ignition is switched off, and a door is not opened. If a door is opened, then power will remain for a further 45 seconds. In Order to add this feature, you will need to add a Relay to power the power window switches, as the BEM Module will not be able to supply the current required for the power window motors.